The casket of late opposition leader Morgan Tsvangirai is carried into Mabelreign Methodist Church in Harare for a memorial service. Zimbabwe´s president on Sunday praised opposition icon Morgan Tsvangirai who died last week as an outstanding political figure who had endured political hardship and deserved his place in the country’s history. Tsvangirai, the strongest and fiercest opponent ever to Robert Mugabe and his ZANU-PF party’s four decades of rule, died on Wednesday, aged 65 at a hospital in South Africa where he had been undergoing treatment for colon cancer. “When we write the history of this country we cannot leave out the participation and role that the former prime minister played in the effort to entrench democratic values in this country,” President Emmerson Mnangagwa said shortly after offering his condolences to Tsvangirai’s family. 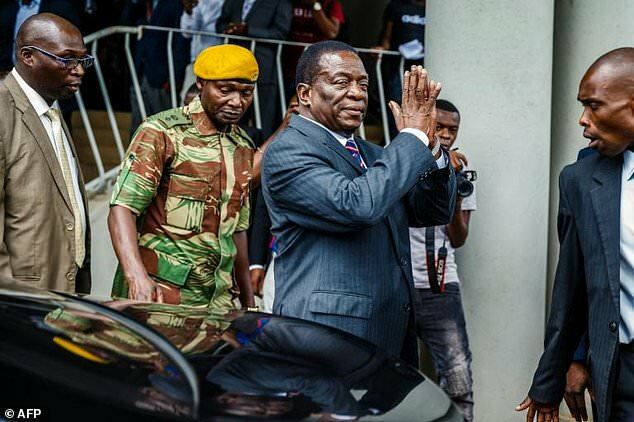 Mnangagwa also urged unity as the country mourned the death of a man who had become the symbol of resistance to authoritarian rule and of the fight for democracy. Before being forced into a power-sharing deal with ZANU-PF as a prime minister, Tsvangirai was beaten up by police, his rallies were banned and he was charged with treason and jailed. Mnangagwa said the upcoming elections in Zimbabwe, expected by July, should be free, fair and credible as a tribute to Tsvangirai. “I am appealing to all political parties in this country to hear my call that we need no violence in this country. We need fair, free and credible elections this year,” he said. He had beaten long-time ruler Mugabe in the first round of presidential elections that year, narrowly coming short of garnering enough votes to be declared the winner. Tsvangirai’s death came as tensions over his succession are threatening to tear apart the MDC, which he had led since its formation in 1999. A split in the MDC could hand advantage to Mnangagwa who took power from Mugabe following a military takeover in November.